Recently, the police in Parbhani district of Maharashtra has issued the warning to the ‘admins’ of WhatsApp groups that they should ensure that no objectionable content is circulated to the group. If police find any objectionable content in WhatsApp groups, offenses under the Information Technology Act as well as IPC will be registered. Well, if you are using WhatsApp and manage several groups, then you need to read this news. 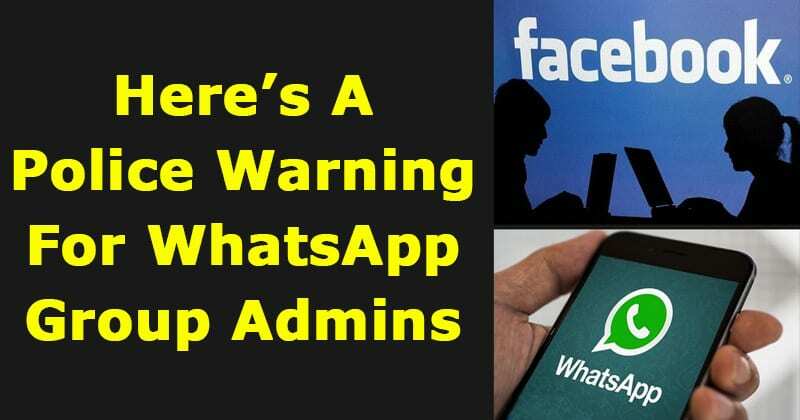 Recently, the police in Parbhani district of Maharashtra has issued the warning to the ‘admins’ of WhatsApp groups that they should ensure that no objectionable content is circulated to the group. Group Administrators are the one who has full control over the WhatsApp groups, they can see and manage the contents that are shared by the group members. Multiple persons can also be admins for one group. The letter sent by the authorities to police stations in the district says WhatsApp group should not have any disrespectful content including text, pictures, audio or video clips about historical or iconic figures, places of worship or anything that may hurt religious sentiments. Not only these, Sanjay Pardeshi also said that if any Group admin finds such post in WhatsApp group, it should be immediately reported to the police. Dilip Zalke who is the district superintendent of Police Dilip Zalke said that police took this step after incidents of defamatory content going viral through WhatsApp groups were reported. He also said that “Even to forward such a content is a crime”. If police find any objectionable content in WhatsApp groups, offenses under the Information Technology Act as well as IPC will be registered.